Archive from category "2018 Videos"
Patience is a critically important trait for all surgeons to develop and maintain. 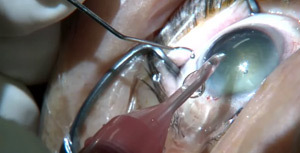 In this patient, Dr Mackool demonstrates its value during removal of a red/brunescent cataract in a one-eyed patient. In response to viewer requests, this video demonstrates the Divide and Conquer procedure using a curved ultrasonic needle (Balanced Tip). A useful method of eyelash isolation is also shown.